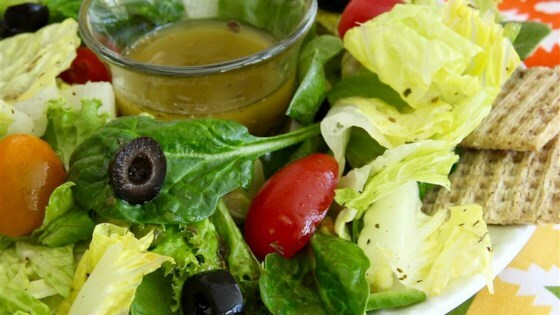 "Greek salad dressing has a little too much bite for me, so I added some of the ingredients used in French vinaigrette. This is still fresh and tangy, and a nice dressing for summer salads." Stir Greek seasoning and water together in a small bowl; let stand until seasoning is moistened, about 5 minutes. Crush the garlic clove with the side of a knife; sprinkle kosher salt over garlic and mash garlic and salt together into a paste with the edge of the knife. Whisk garlic mixture, olive oil, wine vinegar, lemon juice, lemon zest, Dijon mustard, pepper, and sugar into Greek seasoning mixture until combined. One word "wonderful" Don't change a thang! I used this dressing with a greek orzo salad. Delicious. delicious and not too heavy. Every last drop of salad seasoned with this dressing was eaten. Making more right now. A real keeper. Followed the recipe exactly; delicious!